Here are the March 2011 statistics for all single family homes and condo/townhomes sold in the Greenville Area MLS. The numbers are up quite a bit from February. This is a mixed report as the amount sold homes and average price have gone up, the average days on market have also gone up. One of the goals I have for my clients is to make real estate transactions as easy as possible. I have recently added electronic signature services that are making transaction even easier. a. Meet with the client in person for signatures. b. Email the document and have the client scan and email the signed copy back. c. Fax the document and have the client fax the signed copy back. a. The client could be out of town. b. The client might not have access to a scanner or fax machine. c. The client's schedule just does not work to come meet for signatures. With the new electronic signature service, clients just need the ability to get on line. Any document, from contracts to repair requests, can be sent to the clients email and electronically signed. The electronic signature system has already saved a lot of time for my clients. One was traveling out of town and able to sign a repair request when he arrived at his hotel. One had inconvenient work hours and was able to sign when he got off of work. The best part in each instance has been that it only took a minute or two to sign and was extremely easy for the user. The signer authentication methods used by the service make it totally secure to use. Of course, if a client is not comfortable with signing electronically, I am more than happy to do it the old fashioned way. I recently did a search on Greenville, Greer, Simpsonville, Taylors, and Travelers Rest and found that 119 homes sold between $200,000 and $300,000 in May and June of 2009. 4 of the 119 were an auction or unusual situation leaving 115 that were normal transactions. Out of the 115 normal transactions, all but 3 came down quite a bit on their price. The 3 homes that did not come down in price were all new construction and most likely had features added that made the price go up. Out of the 115 homes, the average difference from list to sales price was -$19,582. Something to keep in mind, the $19,582 average price that the 115 homes came down was taken off of the current listing when it sold. It does not include the original price that they might have started at if there was a previous expired listing. That means the total average price drop is probably much higher than $19,582. At the same time, we seem to be seeing a surge in first time home buyer sales. The first time home buyers are starting to realize that they have to close on their home by November 30th to get the $8,000 tax cut. This has created quite a bit of movement especially in homes under $130,000 that are priced and staged right. I recently listed a home in the $120,000's that showed 15 times and had an offer by the end of the first week. The home looked great on line and the web traffic was extremely high. Homes in the $200,000's plus that are getting the same exposure are doing well to get 15 showings after months of being on the market. We can take a few things from all of this. First, the market is not that bad if you are selling in the first time home buyer range. If you are buying in that same range, don't expect to find any great deals. There are a few great deals out there but expect them to go fast and have multiple offers. Second, if you are selling in the $200,000's plus you have to be aggressive and really stand out from the competition with pricing and staging. The good news is that the activity that we are seeing with the lower priced homes has potential to create a ripple affect. The people who are selling the lower priced homes could move up in price range after they sell and and this could increase activity in those upper price ranges. When doing a search through available homes on the Greenville market, I found that seven styles seem to be the most prominent in the Greenville area. The seven most prominent I found are Traditional, Ranch, Bungalow, Contemporary, Colonial, Victorian, and Cape Cod. The Traditional style is used more than any other to describe homes on the Greenville market, however, it is really hard to put a definition on Traditional style. Traditional can be a label put on a mix of different classical American styles or to some people it can even be used to describe other styles like Colonial, Georgian, or Cape Cod. Traditional is a very safe label when a home does not have an obvious style. The Ranch Style is the second most prominent used to describe homes on the Greenville market. Ranch homes were most popular in the 50's and 60's. Common features include pitched-roof, picture window, brick exterior walls, and built-in garage or car port. Ranches are one story homes that are usually not as open in floor plan as homes built today and most of the Ranch style homes in Greenville are on crawl spaces with a small number on basements. The Bungalow style is not quite as popular as the ranch but could be used to describe a number of homes on the Greenville market. Bungalows were most popular on the East Coast in the early 1900's. They are usually one story, rectangle shaped, narrow homes that do not have an attached garage and are smaller in size. The Bungalow is considered a forerunner of the Craftsman style. Contemporary, Colonial, Victorian, and Cape Cod styles are sprinkled throughout the Greenville market, but just remember, if you are not sure, call it Traditional. As different versions of the so called stimulus package were coming through Congress, there were many different ideas batted around concerning tax credits and home buying. The Senate's original bill had a tax credit of up to $15,000 (depending on how much you pay in taxes) for ANYONE who bought a home this year. The $15,000 credit was one of the only stimulating things that the bill had going for it but unfortunately it was drastically changed in the final version. The final version of the stimulus only gives an $8,000 credit and is restricted to first time home buyers. This could also include people who have not owned a home in the last 3 years. First time home buyers can receive the credit on their 2010 taxes and the home has to be bought sometime between January 1, 2009 and November 30, 2009. First time home buyers that bought in 2008 are still eligible for the old $7,500 credit, however, there is a big difference in the old $7,500 and the new $8,000. The $7,500 credit is more like a loan than a tax cut. It is interest free but you still have to pay it back. The $8,000 is a true tax cut that you don't have to pay back. The only catch is that you have to stay in the home for at least 3 years. While I am always for tax cuts, I'm afraid that this one comes with a lot of junk. The only real stimulation happening here is in stimulating the size of our government. People always ask me "how is business?" or "how is the market?" I feel like many of them expect to hear that things are really slow when it is just the opposite. God has provided so much business for me that I have not experienced a slow down. While certain parts of the Greenville market have slowed down it is still a very healthy market to be in and actually a good market in certain areas. I cannot emphasize enough that we must keep things in perspective. If you listen to most politicians and certain news media today, you would get the impression that our entire way of life is coming to an end and that no one is able to buy a home or get a mortgage. These fear mongers are using the problems caused by bad loans (which they caused!) to scare people and gain more power. This irresponsible behavior by media and politicians hurts the confidence of average people who think that they will not be able to get a loan because of everything that they have heard. I help people with the contract to close process every month and none of them have had trouble getting their loan to go through. I work with lenders who help many people buy homes in Greenville every week and they are ready to help anyone who is ready to buy. Some South Carolina elected officials are telling us that if certain legislation does not pass that you will not be able to get a loan beginning immediately. At the same time these politicians and media are spreading fear, the lenders that I work with are telling me to bring as many people to them as possible that want to buy a home. They are ready to go! I have seen victims of the fear mongers this week. People who thought they would not be able to get loans anymore because of what they had heard on the news but after talking to a lender found out that it would be no trouble at all! Sure, there are those who cannot get a loan who could have a few years ago but these are people who should have never been given a loan in the first place and one of the main reasons for the mess we have now. Again, we must keep everything in perspective. If you listen to all the bad news you hear you might think that this would be a terrible time to be in real estate. Not the case. 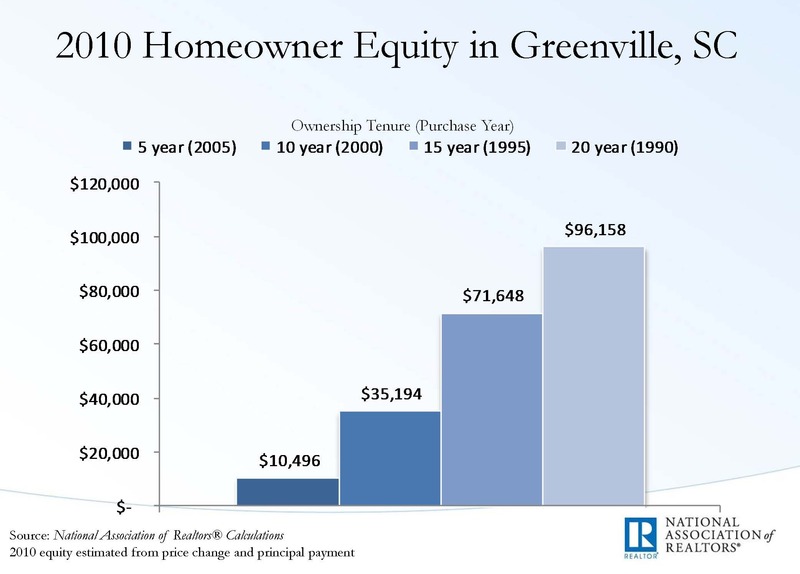 I would rather be in Greenville real estate in 2008 than in 2000! The number of single family homes sold in the Greenville area in August of 2000 was 531 with an average price of $142,206. Compare that with August of 2008 where we saw 689 homes sell with an average price of $195,153. Which market would you rather be in? I'll take 2008. I am eagerly awaiting the September numbers for the Greenville Area and interested to see how October shapes up as well. While all of the bad loans of the last few years have created a very serious problem, we cannot loose our heads over the whole thing. We must deal with facts, not fear.